Please note that we are an alternative payment platform and can only help you resolve transaction problems. We do not provide support for games or apps. 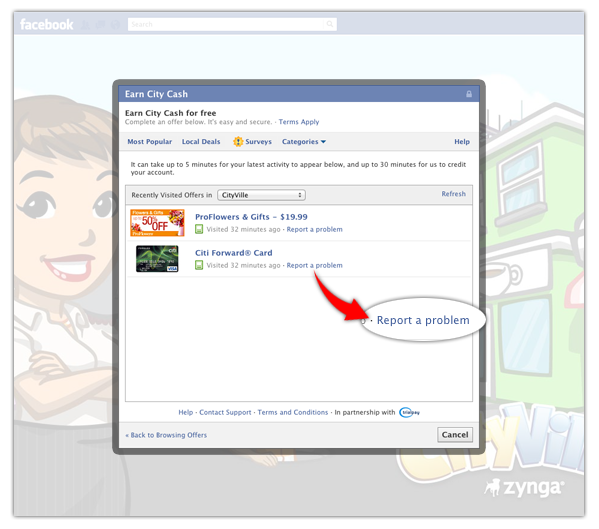 If you are having problems that do not involve a transaction, please contact your game or app's support team. How do I contact support about a virtual currency offer? Please return to the website or game that offered the currency and access the offer wall again. 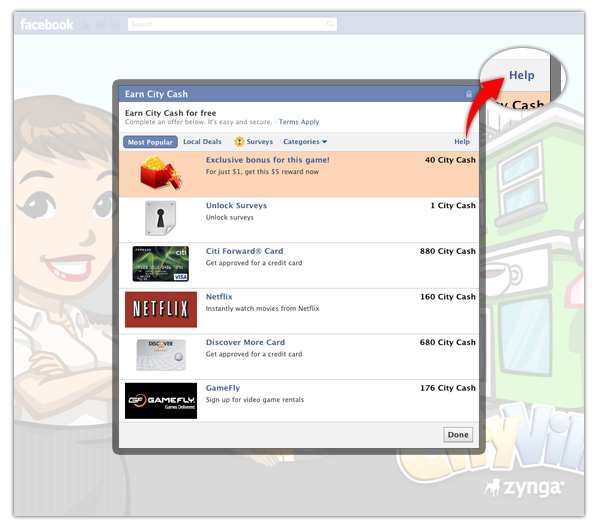 The offer wall contains a Help or Support link that allows you report problems with any offer you have clicked. 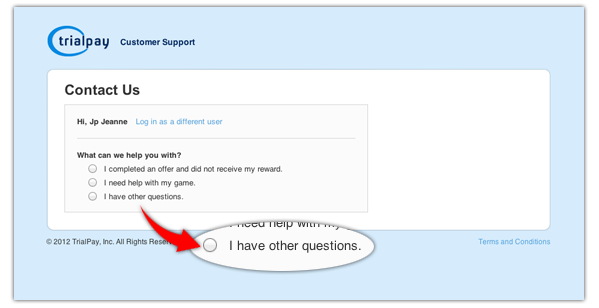 We need you to use this form because our normal support form cannot identify you. My order was unsuccessful but there's a charge on my card. Why? If your order was unsuccessful but you see a charge on your credit card statement, the charge is most likely a pre-authorization. Pre-authorization charges are simply holds for the authorization amount, and will be released in 2-3 days. If you try ordering again, please verify that your credit card information is accurate before submitting our order. How can I get a refund for the game credits I purchased? Sales are final once the credits have been successfully delivered to an account. If an unauthorized purchase has been made with your card, please contact the TrialPay support team. Why do some advertisers need my credit card for free trial offers? Some advertisers use your credit card to validate information you submit, and some use it to renew your service if you decide to buy it after your trial period ends. Why can't I pay with some payment methods? Our game developer partners choose which payment methods to offer. If you do not see a specific payment method in a game's TrialPay payment window, the game developer does not accept that form of payment. Please note: To receive credits by completing an offer, you MUST access the offer through the game's TrialPay payment window, not through other means. Why do my friends see different offers? 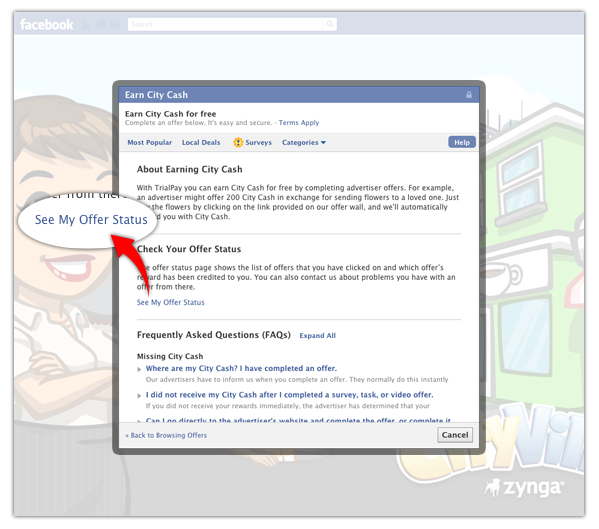 We show offers based on various demographics such as region, account history, reward amount, or time of year. The offers you see when you first access a game's TrialPay payment window are all the offers specifically available to you. How do I "copy and paste" a copy of my receipt? 1. Place your cursor at the beginning of the text you want to copy. 2. While holding down your left mouse button or touchpad button, drag your cursor to the end of the text. This should highlight the text. 3. Press the CTRL and C keys at the same time (Command and C keys for Mac users). This copies the text to your clipboard. 4. Place your cursor where you want to paste your text (in a new document, for example). 5. Press the CTRL and V keys at the same time (Command and V keys for Mac users). This inserts the copied text. I clicked an offer but it didn't take me to the advertiser's Web site. Can I go to the advertiser's Web site on my own and still get credit? If you clicked an offer and are not taken to the advertiser's Web site, the offer may be expired, or experiencing technical problems. 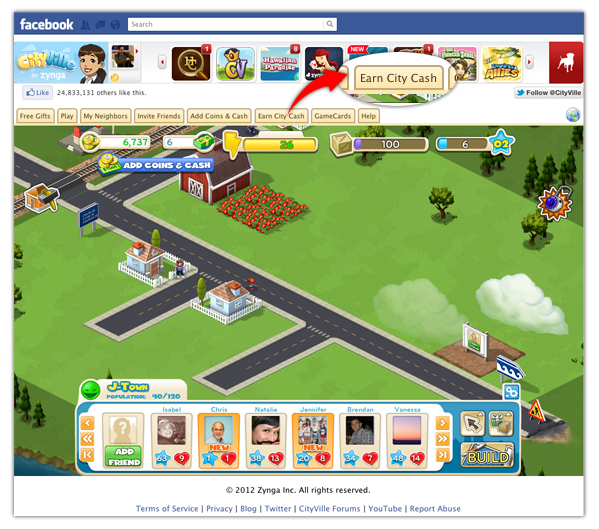 You will not receive credit if you bypass your game's TrialPay payment window and complete an offer. In order to receive credit, you must click the advertiser's offer in the TrialPay payment window and complete the offer in the new window that appears. I didn't get a confirmation e-mail. What should I do? Please check your junk mail or SPAM folders. If your confirmation e-mail is not there, you'll have to contact the advertiser directly and request a new confirmation e-mail. We can't help you get your credits without a confirmation e-mail. I completed an offer earlier that now rewards more game credits than before. Can you credit me the difference? Unfortunately, we cannot credit the difference between past and current reward amounts. I completed a survey, task, or video offer, but did not receive credit. What do I do? If you did not receive credit, the advertiser determined that you did not satisfy the offer's requirements. Because of this, we CANNOT issue you a manual credit.